If the idea of tackling a big project makes you want to crawl back into your hole like Punxsutawney Phil, then this edition of Tips & Tricks is for you. So let's break it down, Springy style, and we'll get you focused on micro-projects where you can feel accomplished... fast. Did you know that it takes 3 hours to write the average blog post? And that average blog post is about 1142 characters in length? A typical LibGuide is probably twice, if not triple, the size of an average blog post - meaning it takes between 6-9 hours to create a LibGuide. After you've put all that work into creating your LibGuide, you want to get the most bang for your proverbial buck! 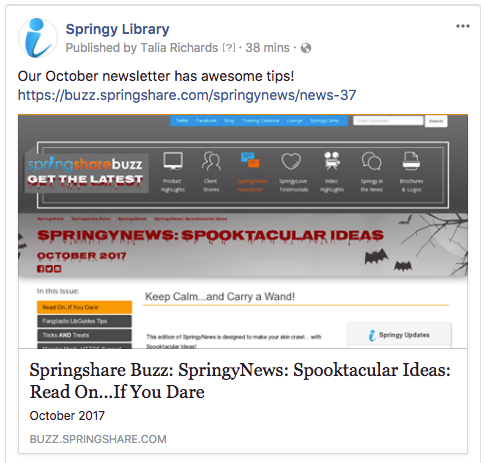 Here are some ideas for repurposing and repackaging your content to reach new audiences, gain extra authority, and reinforce your message. Write a LibGuides Blog Post: Summarize the main points of your LibGuide into a blog post and point to the full LibGuide for more information. Entice blog followers to read the entire LibGuide. Create a Gallery Box on your Homepage: Create a rotating slideshow of topic-specific LibGuides and add it to your LibGuides homepage. Capture new audiences by repackaging your content, visually. Embed your Gallery Box anywhere using the widget code! Create a Micro Website: If your LibGuide contains a lot of content, it might not translate to mobile devices, which are better at communicating streamed down content. 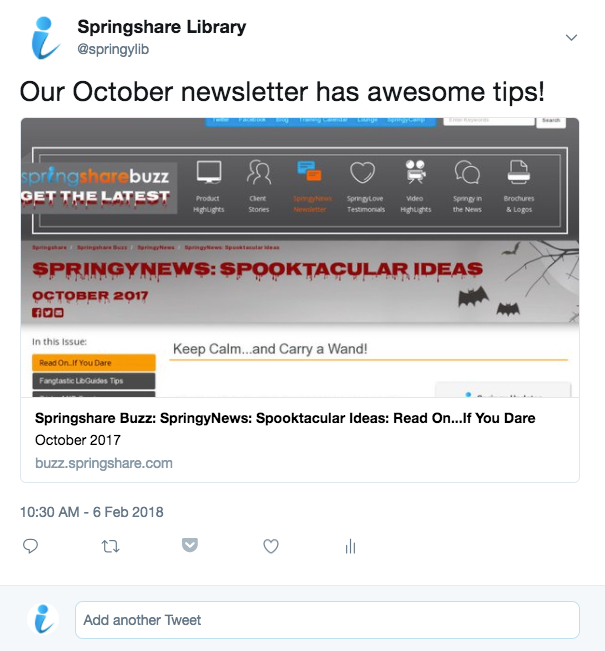 Create a mobile microsite using the mSite Builder that is a slimmed-down, repackaged version of your full LibGuide...specifically for mobile users. Tip: Add the mSite Builder redirect code to your guide's custom CSS/JS code area (LibGuides CMS only). This way, mobile users to your LibGuide will automatically be redirected to the micro version. One of the best ways to overcome weariness is to tackle obstacles that zap your energy. There's something about the act of weeding that not only revives that space but also your mindset toward that space. A clean desk helps you become more enthusiastic about your work. Unclutter your LibGuides system, and watch your team's guide-building enthusiasm soar. Note: Regular-level users can only delete their own assets. 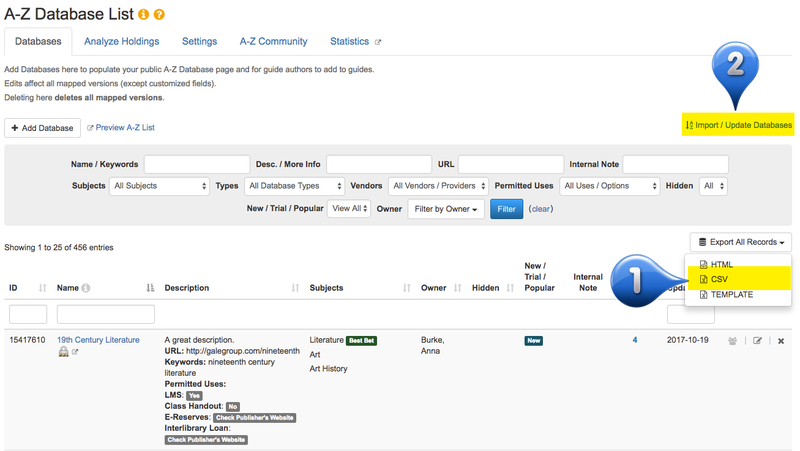 Admin-level users can edit all assets, system-wide. If you have hundreds of unused assets, that cathartic click & delete can get old, fast. Contact our support team and we can delete these unused assets for you in a flash. Let us know which kind of assets you'd like to delete, and be sure to let us know whether this includes database assets. Please note that "unused" here means "not used in a guide," so proceed with caution if you're not sure whether your databases are assigned to guides or not. There is no undo for deletion - please proceed with caution! A great way to tackle a project is to break it down into micro-projects. Studies have shown that this tricks your brain into increasing dopamine levels by setting and achieving micro-goals. 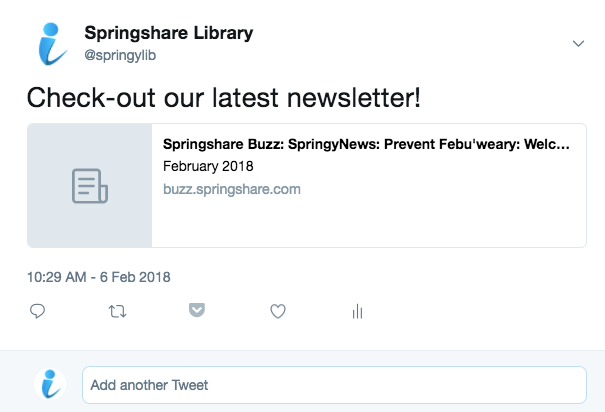 If you're thinking of revamping your LibGuides A-Z List, a great micro-project that you can get done quickly is to update your A-Z databases New/Popular/Trial tagging. Redoing your entire A-Z list is a big project, but retagging your new, popular and trial databases isn't! Micro-progress for the win! Edit each A-Z asset one-by-one, or make use of bulk-editing! Hey, it happens to all of us - you're quickly building a LibGuide, adding in images, and you forget to add that extremely important alt text. In just a moment, your LibGuide went from accessible to inaccessible. "Alternative text provides a textual alternative to non-text content in web pages." In layman's terms, if you're adding images to your LibGuides, they should contain properly-constructed alternative text that conveys the meaning or content of that image. Screen Readers: For visually- or cognitively-impaired users, the alternative text is read aloud by screen reader software. Mobile-Users/Slow Bandwidth: Not everyone has LTE or high-speed internet. For users who choose to disable images from loading on web pages due to bandwidth issues, the alternative text displays instead, providing context. Helps Your SEO: Properly-formatted alternative text provides "semantic meaning and description to images which can be read by search engines." - WebAIM, Alternative Text. You can manually add alt text for each individual image. Or, you can add alt text at the image manager level. Alt text added at the image manager level will automagically pre-populate the alt field every time you reuse that image. So, when you're in a rush and you forget to type in your alt text... LibGuides does the remembering for you! Alt text added at the image manager level is not automatically applied to images currently being used. During the holiday season, cameras abound. Pictures are snapped, poses are held, and photos are uploaded to social media or shared among friends and family. To say you're sick of your picture being taken is probably an understatement. This Springy Tip puts you on the other side of the camera. Take a few minutes and navigate to each and every one of your LibGuides, and take a guide thumbnail. It's a fast and easy project that yields huge results. Guide thumbnail images are automagically embedded into the metadata of your LibGuide. 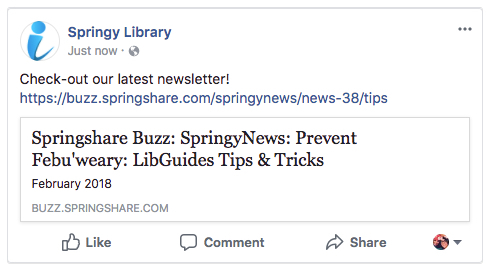 When you share your LibGuide URL on social media, Facebook and Twitter scan the metadata of your guide, find the guide thumbnail meta tag, and display it in your social media posting. Navigate to your guide and Select the Publication Status button > Change Status & Share. 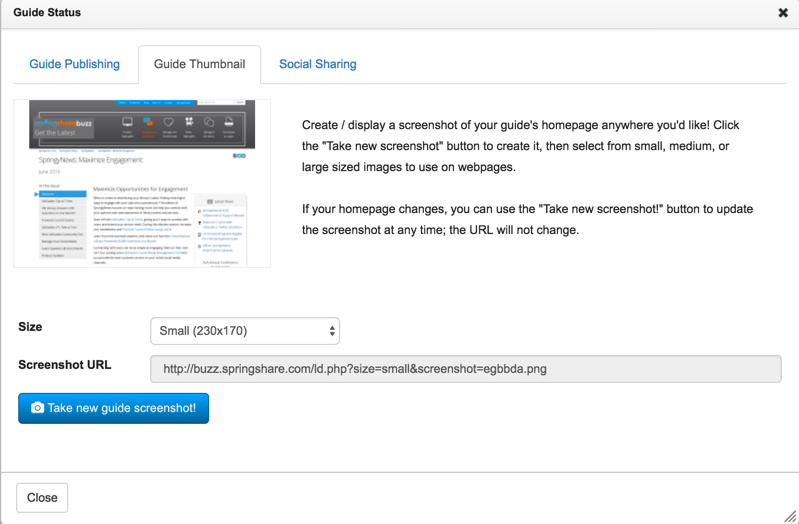 Click the tab titled Guide Thumbnail > generate a screenshot. Right-click & Save Image or use the Image URL to embed in your website, blog, etc.